Britain’s Brexit turmoil inflicted further damage on the economy last month as the nation’s huge services sector shrank for the first time in more than 2 1/2 years. With Parliament gridlocked and Britain’s short-term future increasingly uncertain, companies and households held back spending in March, IHS Markit said Wednesday. Its Purchasing Managers’ Index indicates that the economy shrank last month and stalled over the first quarter, with a risk that the slump deepens in the coming months. The latest twist in the Brexit saga came on Tuesday night, when Prime Minister Theresa May asked opposition leader Jeremy Corbyn to help work out a joint plan in an attempt to break the deadlock and prevent the U.K. crashing out of the European Union without a deal. The pound rose for a third day on Wednesday. 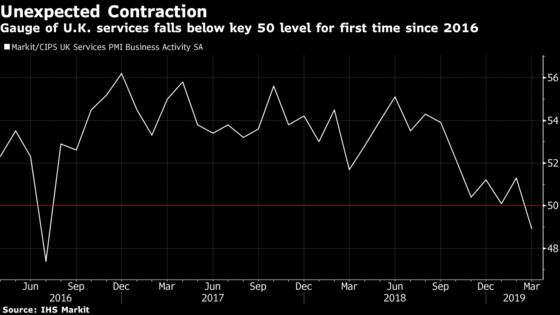 The reading means that the U.K.’s services and construction sectors are both in decline, while manufacturing was buoyed by stockpiling, limiting the drop in a composite gauge to 50.